When designing your outdoor space, it is easy to just buy a fun planter at the store, but if you want more creative garden container ideas, this is the list for you. Each of these fun and creative containers takes something you can easily find in your home or at a flea market and makes it into a beautiful display for your plants. These creative garden container designs have projects for every aesthetic. Have an old desk, dresser, or chair you don’t know what to do with? Add some soil and your favorite flowers for a unique porch decoration. Want a more rustic-looking space? 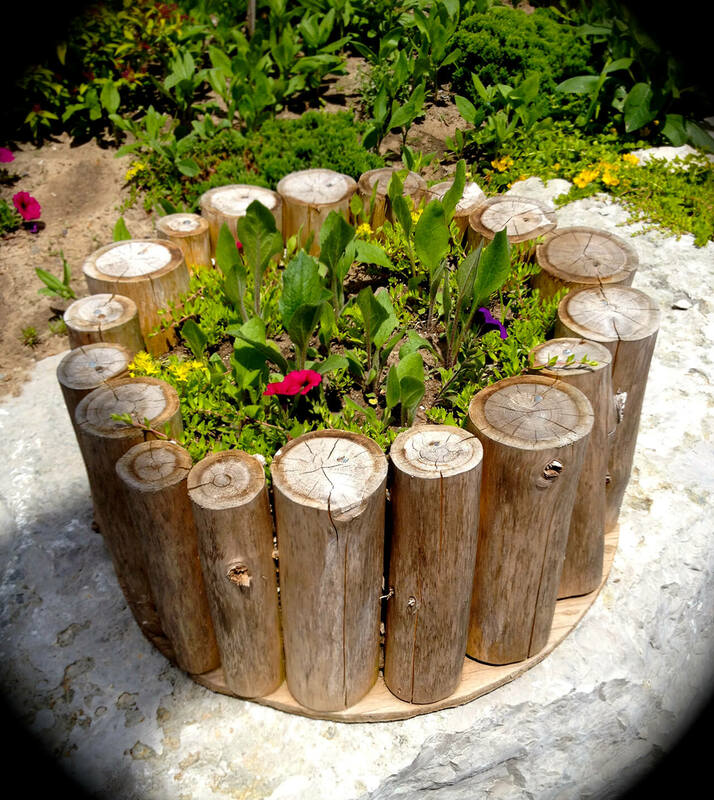 Try one of the creative garden containers using wood or stone. There are even ideas on this list that you make with your kids as an easy family project. 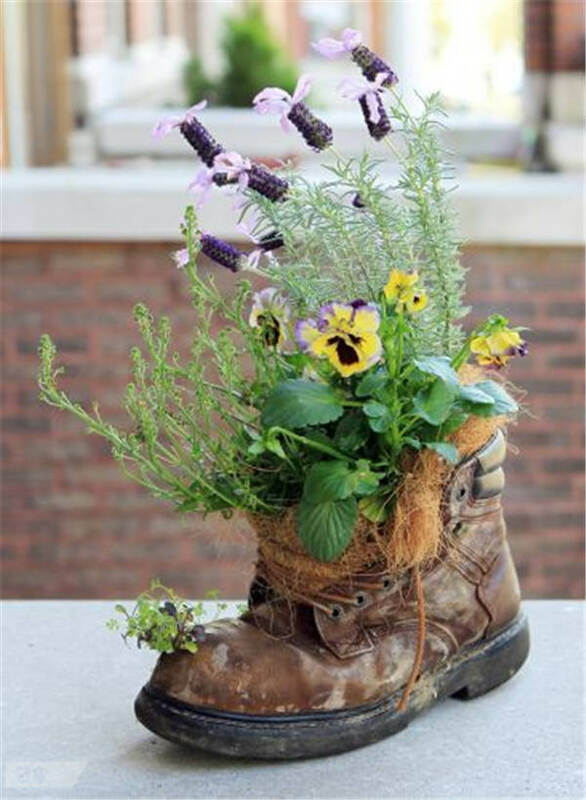 Round up old outgrown rain boots, toy trucks, or laundry baskets and make fun planters out of them together. Whether your outdoor space is large or small, there are creative projects to fit your needs. If you have a smaller yard, try one of the hanging containers to save space. Read on for instructions for making all creative garden container ideas! Anyone who is handy with a hatchet can easily create this planter. Cut into a firewood log, making a channel for the potting soil and plants. Leave space on the ends. 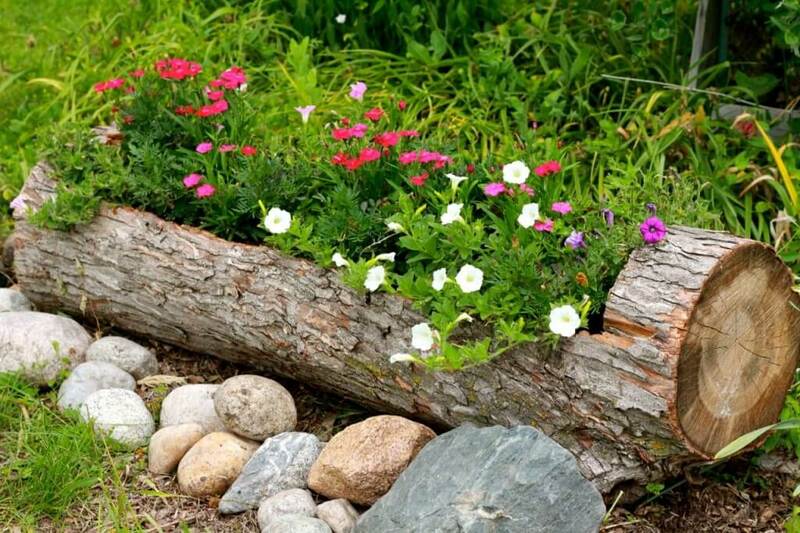 Fill the log with potting soil. 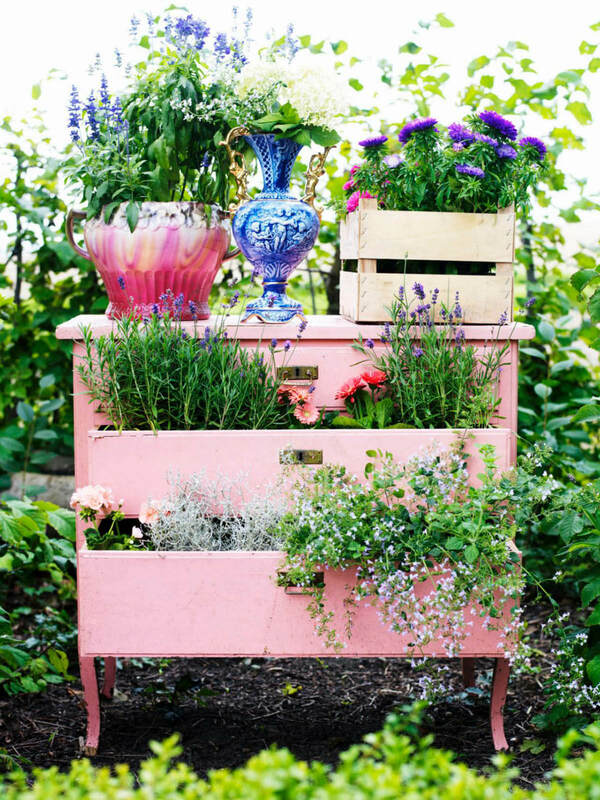 Add a mixture of charming annuals, and display this outdoors. Add rocks around it to keep it from rolling over. 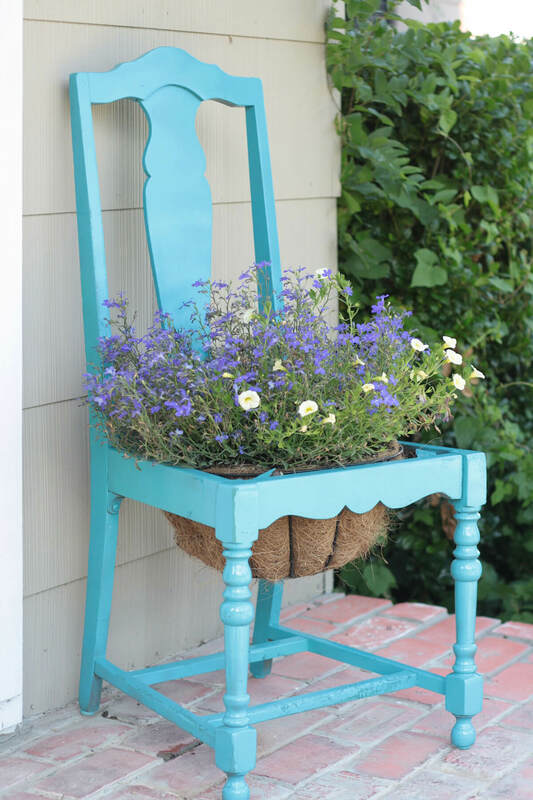 Replace the seat of an old chair with a flower basket. You can paint the chair in a bright color for extra charm. If you like, paint the chair and then distress the finish to give it a vintage look. Try contrasting the color of the flowers and the chair. Colanders make great planters. Not only are they quirky and unexpected, but the holes provide ventilation and drainage for your plants. Small colanders can be used on a countertop or table. They look equally nice with succulents or jade trees indoors or with fresh annuals outdoors. You can even hang them like baskets. 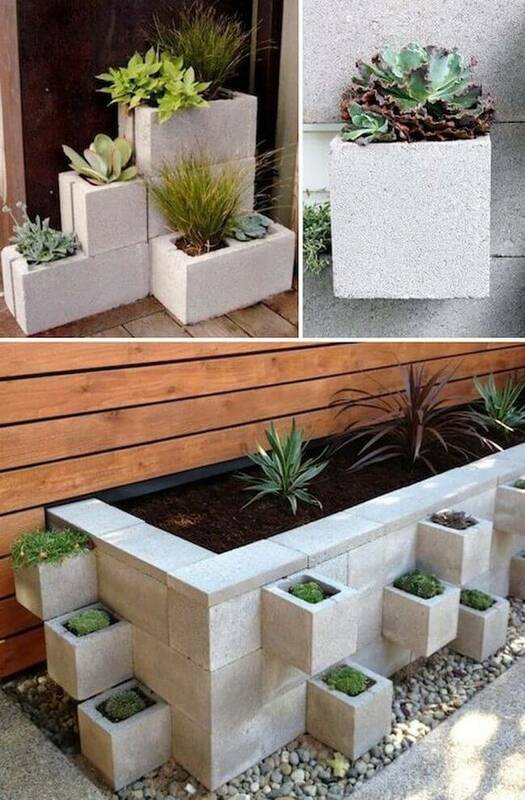 Create modern-looking planters as easily as stacking cinder blocks. You can make these planters free standing or build them into a raised bed. Line the inside of each cinder block with a pot for easy planting. These look very nice with mosses, greens, and grasses. 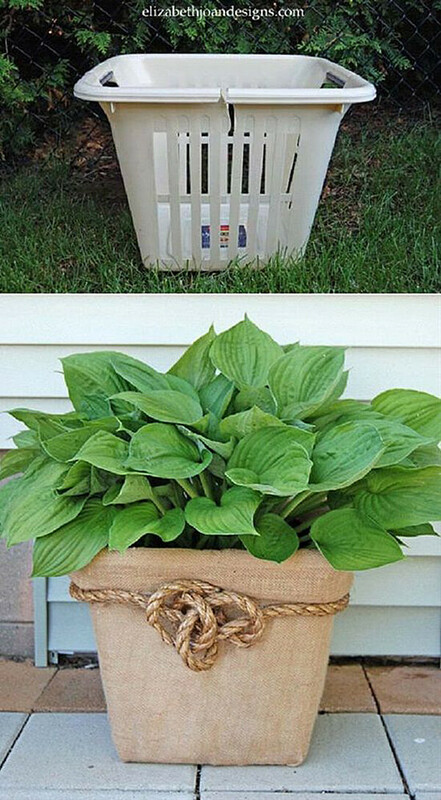 Upcycle an old laundry basket into this attractive burlap planter. Repair any cracks in the planter with packing tape or duct tape. Then hot glue sheets of burlap inside to cover the holes. Continue covering the planter with burlap until it is completely transformed. Wrap a finishing piece of burlap around the top and use it to cover the handles. Finish with a piece of rope. Find an old metal toolbox at an antique store or yard sale. Any small metal container with a hinged lid will do. If you are looking for an authentic antique look, display a tool in the box along with the plants. These containers are especially suited to succulents and greens. Find an old chandelier. It doesn’t have to be wired for electricity. Make sure the arms face up. Take off any globes or vases and remove the wiring if necessary. Clean the chandelier well. Sand lightly. Use epoxy to glue on plant pots and saucers. Paint the entire chandelier with spray paint. Add flowers and greens. 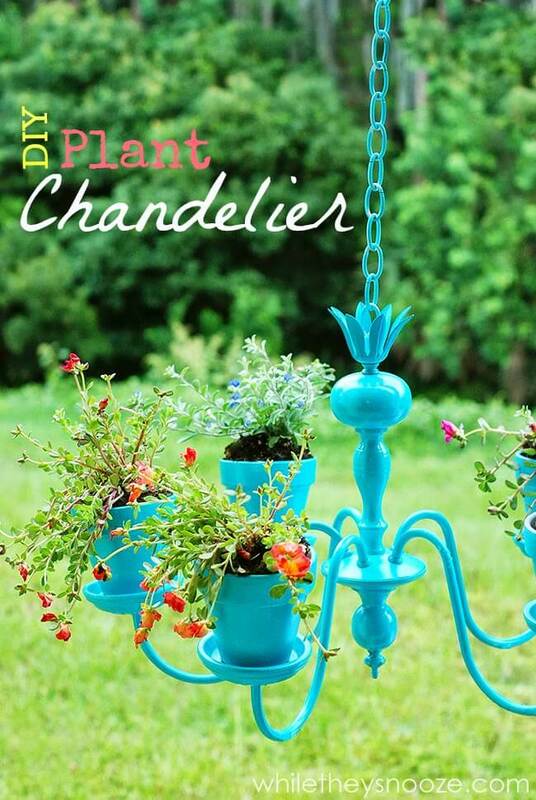 This is a simple idea that provides some shabby chic charm to your garden. Find a large ceramic pitcher at a yard sale or resale shop. Fill this pitcher with potting soil. You can put some large rocks in the bottom to help with drainage and reduce the amount of soil you need. Plant a mixture of annuals in the pitcher. Be creative when using natural stones as planters. You may already have rocks with depressions that are deep enough to plant in. You can also try stacking rocks on their sides and planting in between them. Don’t be afraid to experiment. Succulents and greens would be attractive in these rock planters. You can use an old laundry basket for this project or buy a new wicker basket. 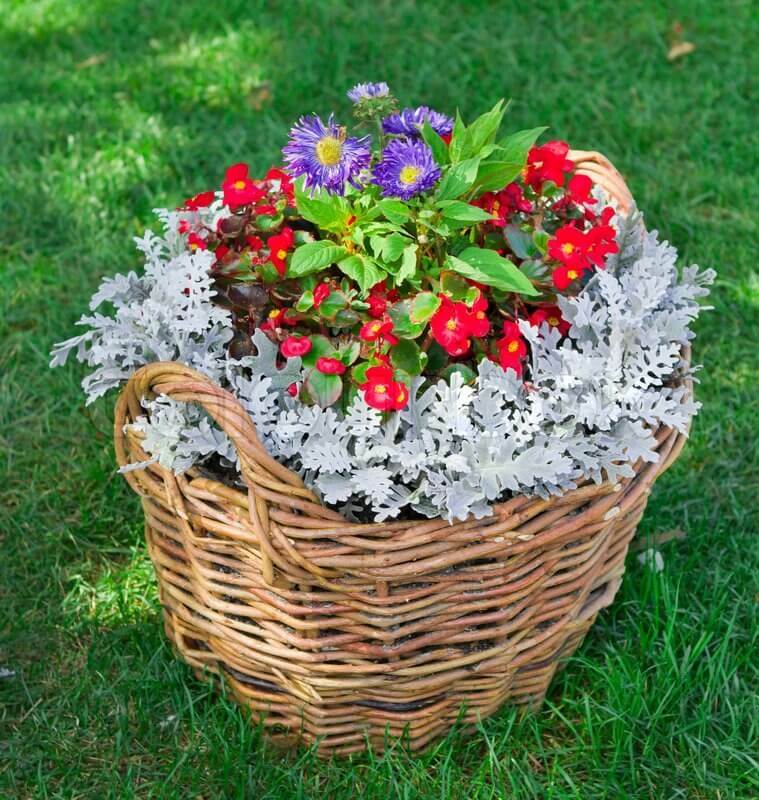 It’s as easy as finding a plain planter large enough to fit inside the basket and then planting it however you wish. Using a layered approach makes for a neat and attractive planter. 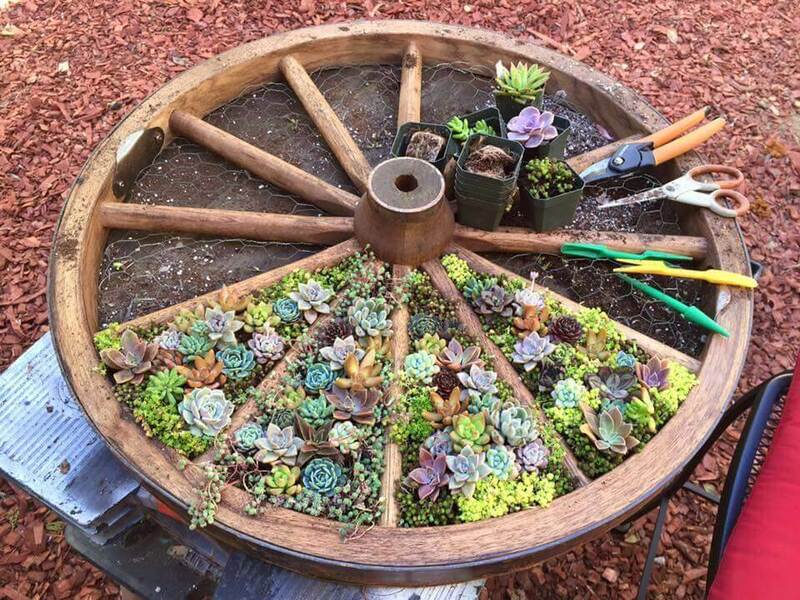 With an old wagon wheel, you can create an impressive display of succulents. Use a container the same size as the wheel. Line the bottom of the wheel with cactus soil. Add chicken wire as a support for your plants. Secure the wheel over the top of the chicken wire. Plant succulents in the holes, packing them in tightly for a finished look. This is a fun and quirky idea that will make your garden stand out. It relies on finding an old claw-foot bathtub: you may be able to find these at estate sales or in resale stores. Fill the bottom with large rocks for drainage. Fill in the top with soil and plant with annuals. Find an old tire. Drill holes in the bottom for drainage. Line the tire with fabric weed barrier. Add Styrofoam packing peanuts to help with drainage. 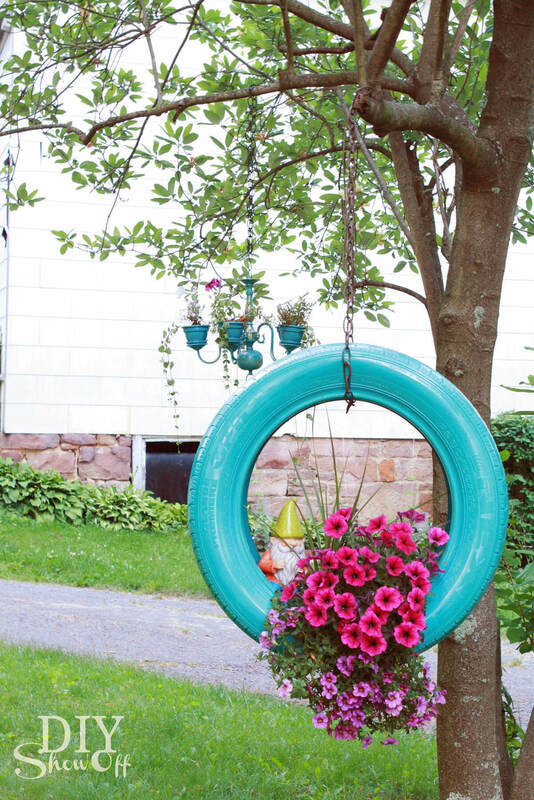 Fill the bottom of the tire with potting soil and add a mixture of hanging and vertical annuals. Hang it from a tree like a tire swing or on a sturdy nail on the exterior wall of your home. This idea relies on finding large seashells with openings that are large enough to fill with potting soil. Select your shell carefully and drill a hole in the bottom for drainage. Succulents do poorly in undrained soil. 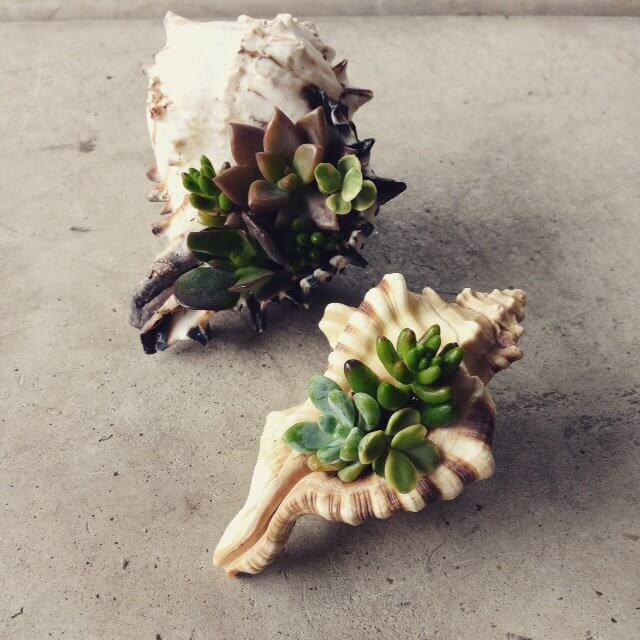 Add plants and display your shells in a sunny place. 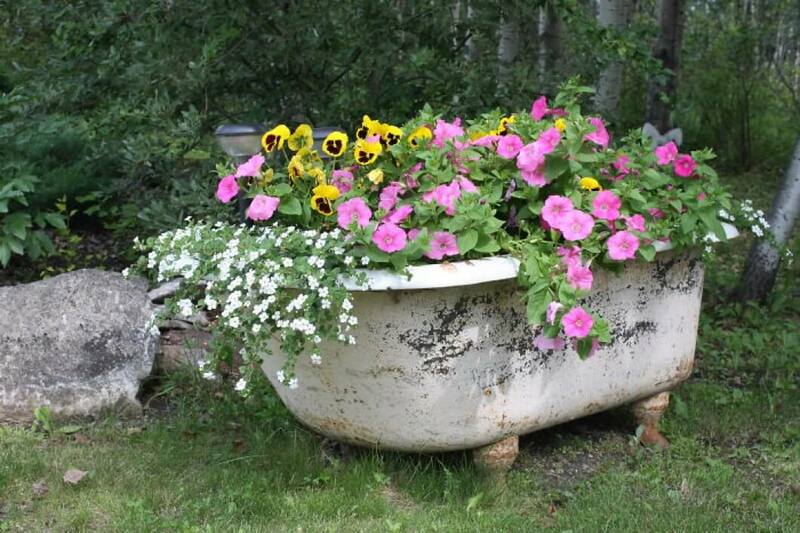 Use vintage washtubs to create a floral display. 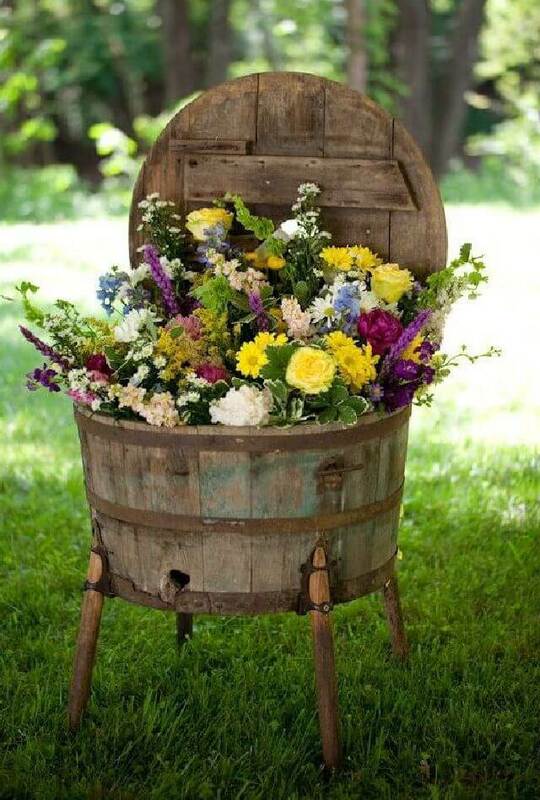 If you can find a washtub with legs, this would make a special accent for your arrangement. Raise all the tubs off the ground with rocks to promote drainage. It is easy to create an attractive arrangement of flowers and greens in these washtubs. 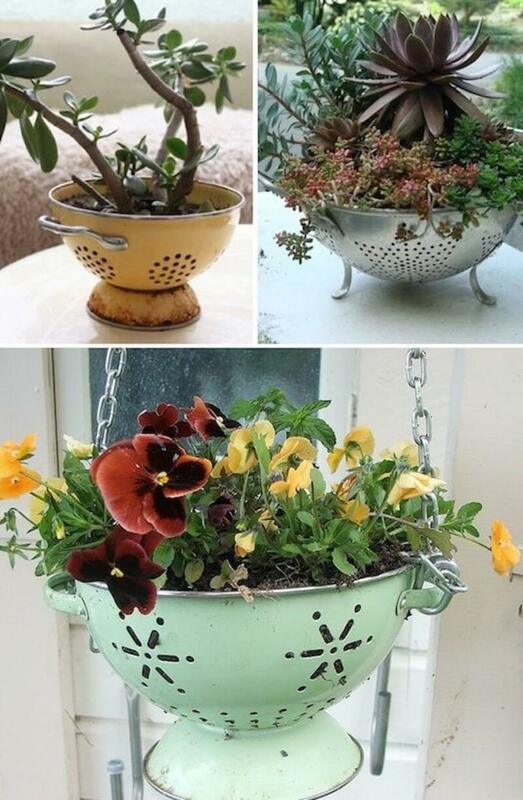 Find old galvanized metal watering cans. 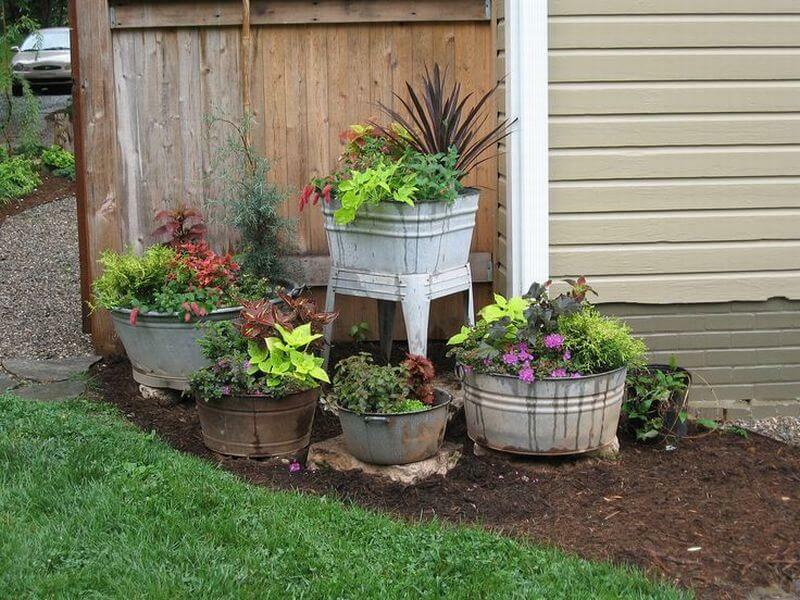 Look through your garage and garden for watering cans that can be repurposed, or try yard sales. Fill these planters with lush upright arrangements for the best look. 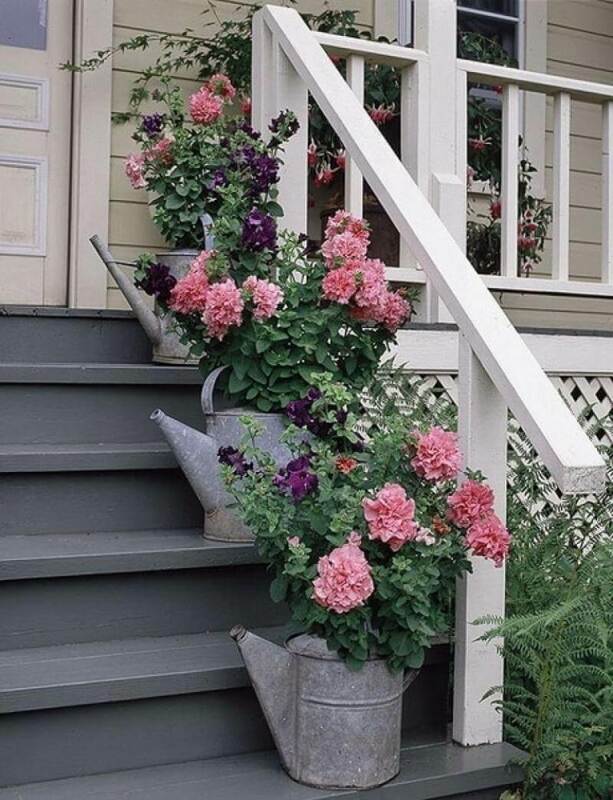 It would be even nicer to use graduated sizes of watering cans going up a set of stairs. Use this palette planter for kitchen herbs. It would be easy to lean up against the rail of a porch or deck. Affix metal rings to the palette with screws. Set small terracotta plant pots in the rings. To tie your display together, paint the tops of the pots with chalkboard paint and use attractive lettering to label your plants. Toy trucks make fun and unexpected garden planters. Just make sure children are not tempted to roll your plants around and damage them. The toy trucks don’t need to be in good condition: rust is fine. 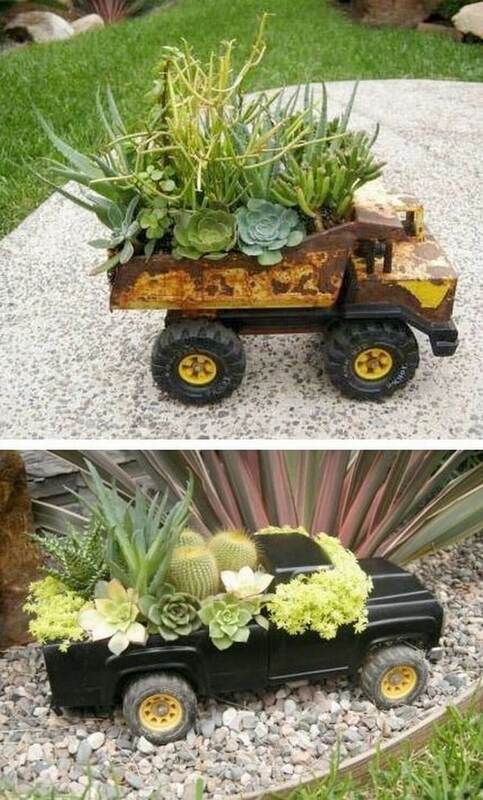 Try filling these trucks with small succulents or upright greens. Make this unique planter yourself with concrete. Mix concrete in a large bucket. Use it to fill sturdy rubber gloves. When the concrete is dry, simply pull off the gloves. 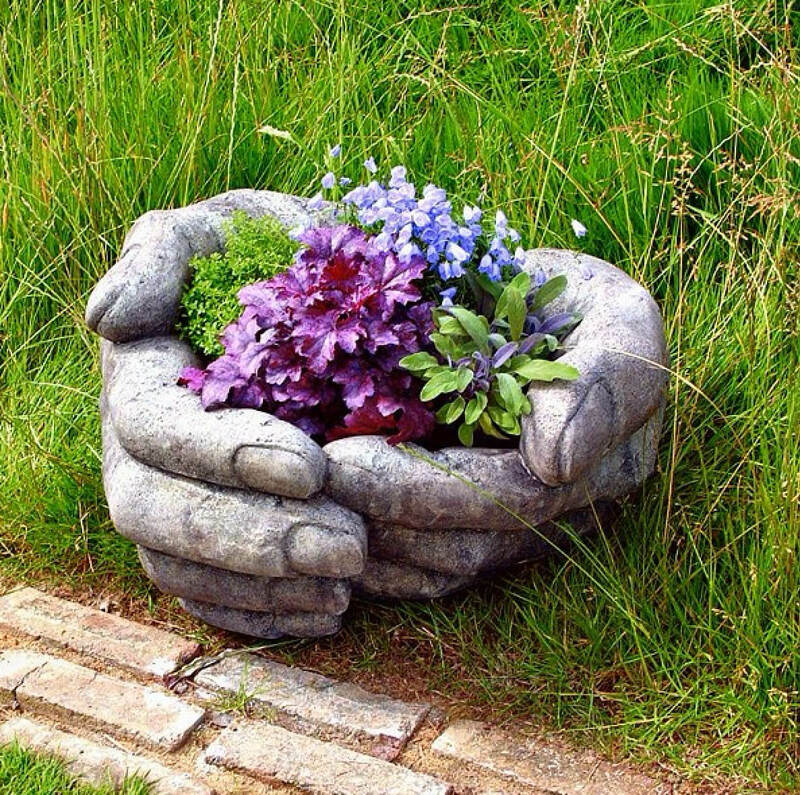 Then fill the hands with pretty greens or flowers. 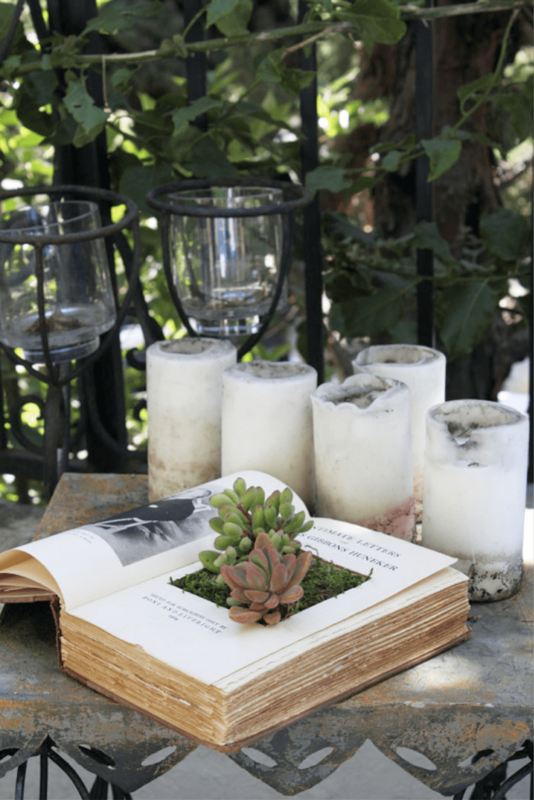 An old book makes an eye-catching planter for succulents. Use a vintage book. Run a thin layer of white glue around the outside of the pages. Cut a rectangular hole into the pages with an exacto knife. This is the most difficult part and requires repeated cuts. Make the hole at least 1 ½ inches deep. Line the bottom with wax paper or a plastic bag and plant succulents inside. 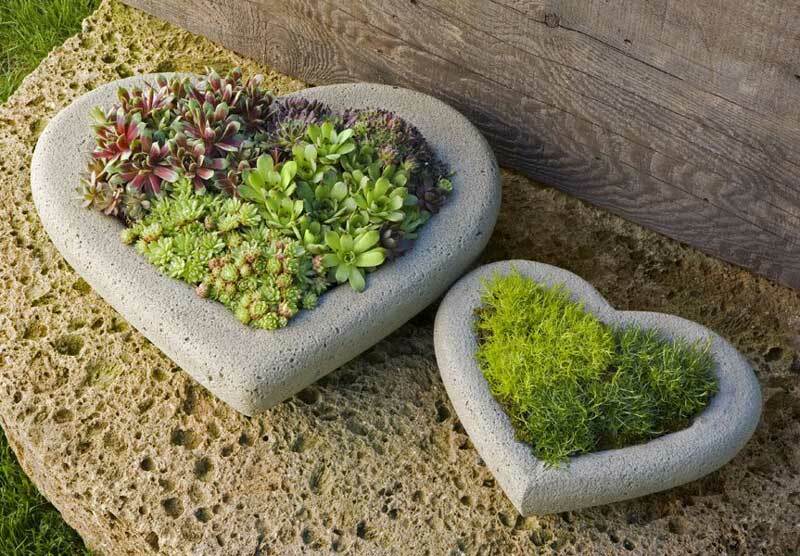 Find flat heart-shaped planters at the home improvement store or garden center. Add potting soil to the bottom. Fill these planters with plants that will not grow too tall. Succulents or greens are good choices. Each shoe pocket in this organizer can be filled with a plant. 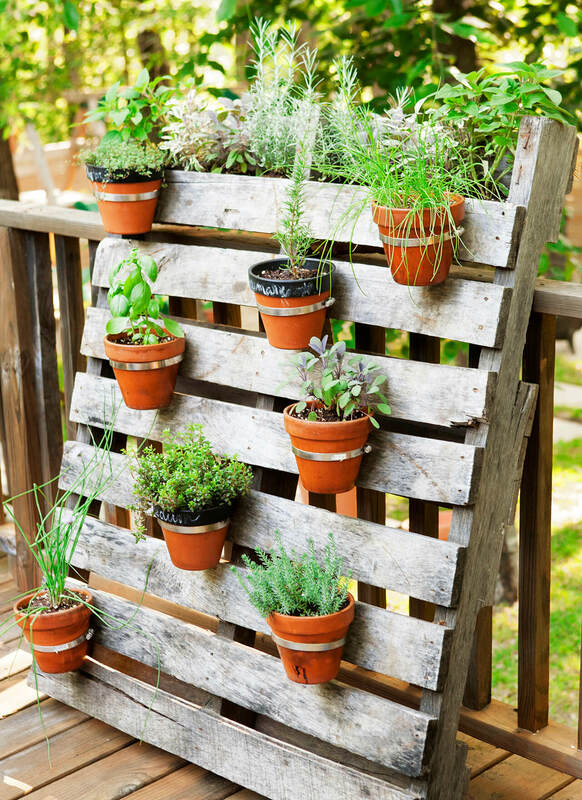 Using it as a kitchen herb garden would be nice, as the organizer can be hung on a sunny wall near the kitchen door. Be sure to water this carefully so that the plants on the bottom row don’t get too soggy. 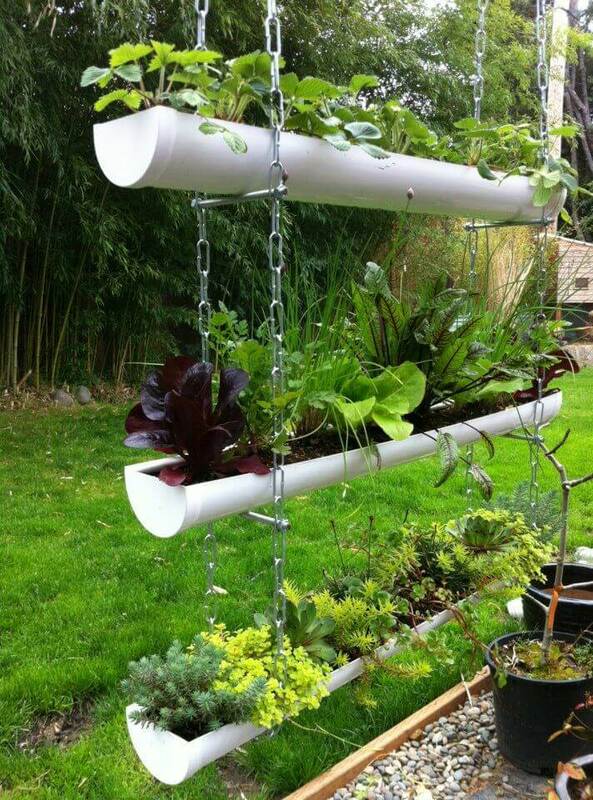 Make a hanging planter with PVC pipe. First cut the pipe and end caps in half horizontally. Epoxy the caps onto the ends of the pipe. Make a hanging ladder arrangement with chains. Secure the planters on the chains. 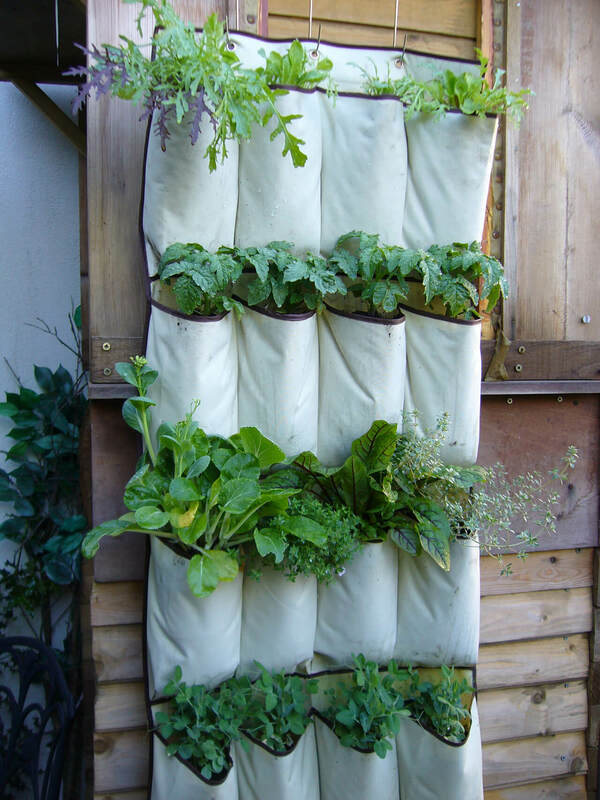 This would be an ideal planter for herbs, lettuce, and other edible greens. Find an old work boot at a thrift store. Remove the tongue of the boot. Drill drainage holes through the sole and the arch. Plant the toe of the boot with microgreens. Line the rest of the shoe with coir, the material found in the bottom of hanging baskets. Fill it with potting soil and the flowers of your choice. 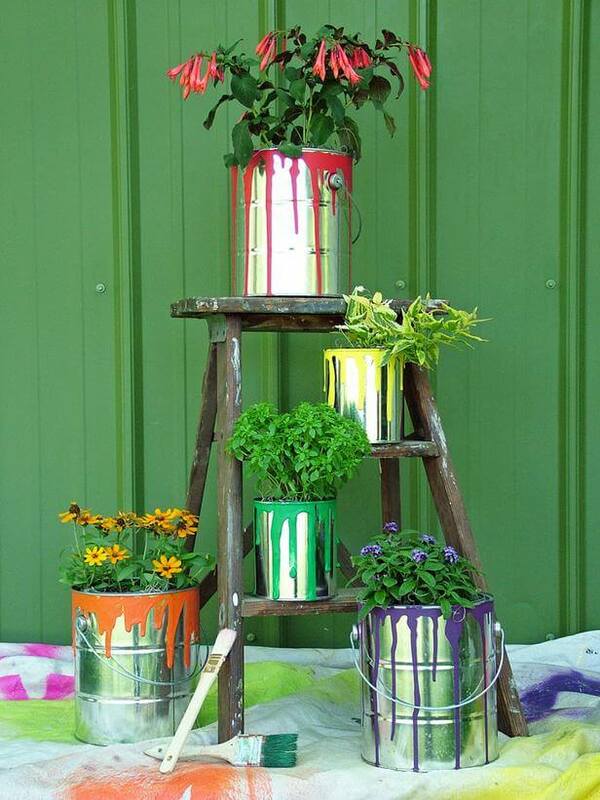 Use old paint cans and a small stepladder for this charming display. When planting, match the color of the flower with the color of the paint on the exterior of the can. The colors tie it all together for a quirky look. 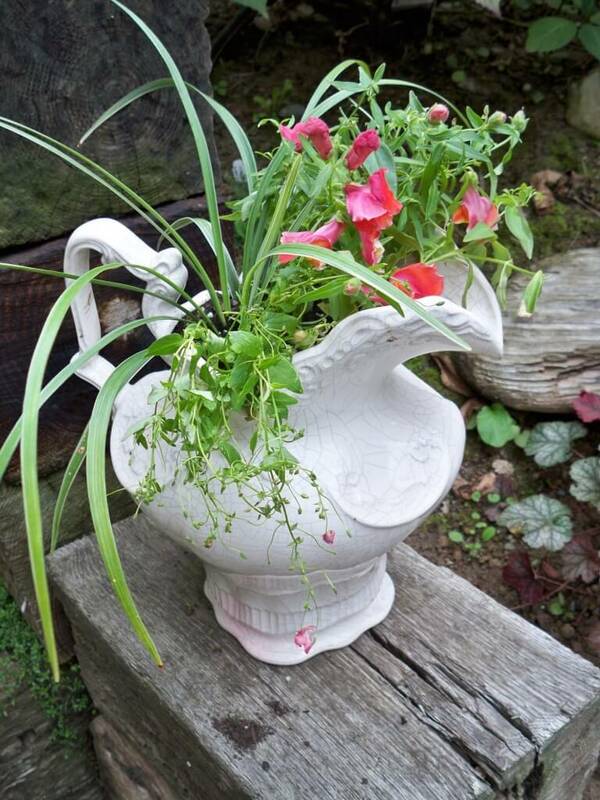 An antique wooden washtub makes an ideal flower planter. It provides drainage and keeps the flowers up off the ground. All you need to do is lift the lid and secure it in place so it will not fall and damage your plants. Then fill the planter with soil and the old-fashioned flowers it calls for. If you can find an old desk, this would make an excellent planter. Paint the desk and chair in a bright color to match. Pull the drawers out in a graduated fashion. Fill these with plant pots or potting soil. This design looks especially nice with a mix of greens and climbing flowers. A kitchen sink makes an eye-catching and attractive planter. Try securing old plates to the bottom of the sink and planting around it. Using white, frothy flowers gives the appearance of dish suds. A bathroom sink would also look nice with succulents and pebbles. This planter bench is not an easy project, but can provide a learning experience for a beginning woodworker. Begin by cutting cedar planks. Sand the planks and assemble into boxes for the ends. When the planters are built, attach them with the bench. Stain the planter bench and add flowers to each end. 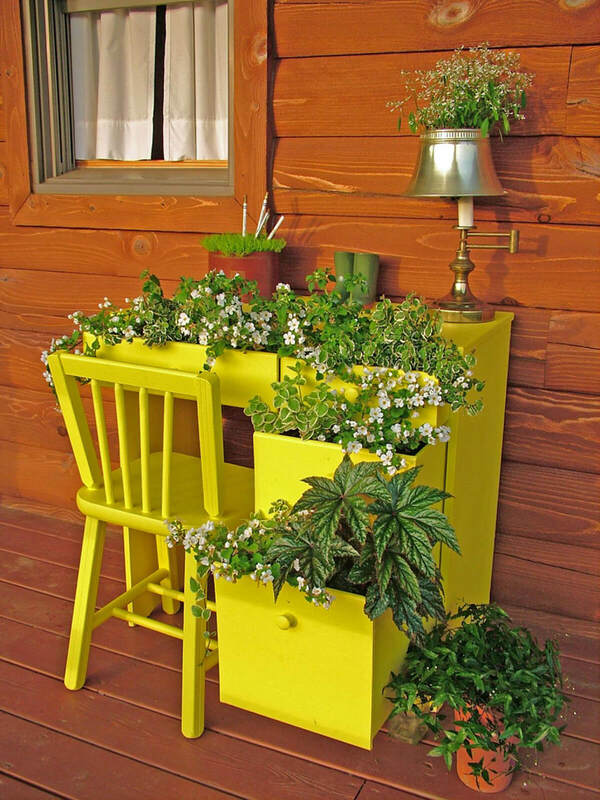 Use an old chest of drawers as a planter. First, paint and distress the finish if needed. Then pull out the drawers in a graduated order from top to bottom. Fill the drawers with potting soil and add flowers. Create a cohesive design by using flowers from one color family. Add interest by combining the chest of drawers with vases and planters. Use a tiny wheelbarrow as an accent for your garden. Paint the wheelbarrow if desired. 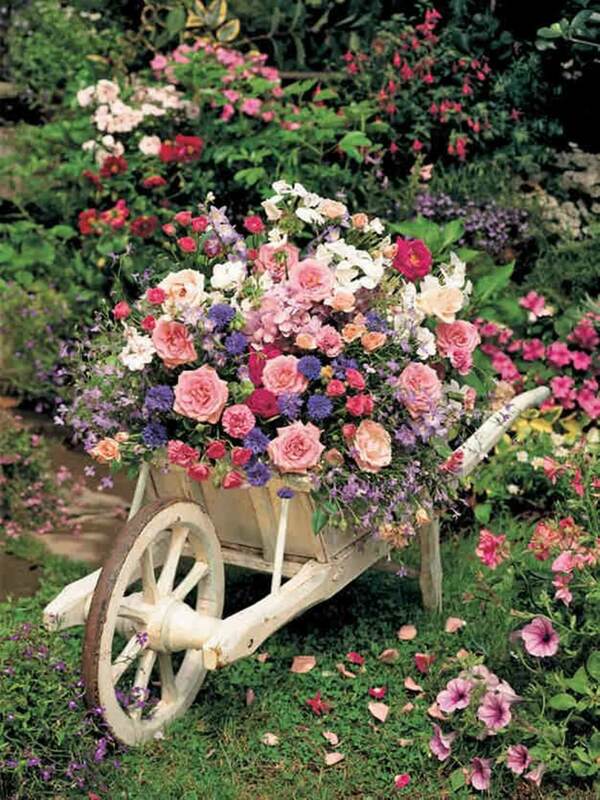 Fill it with lush and overflowing blooms to contrast with the wheelbarrow’s simplicity. This planter can be wheeled from one side of the yard to the other to change up the display as well as moving the planter to better areas of sunshine. Find these understated concrete planters at the home improvement store. These are so sturdy, they will last a lifetime. Use a variety of levels for visual interest, beginning with a bowl that sits low to the ground. 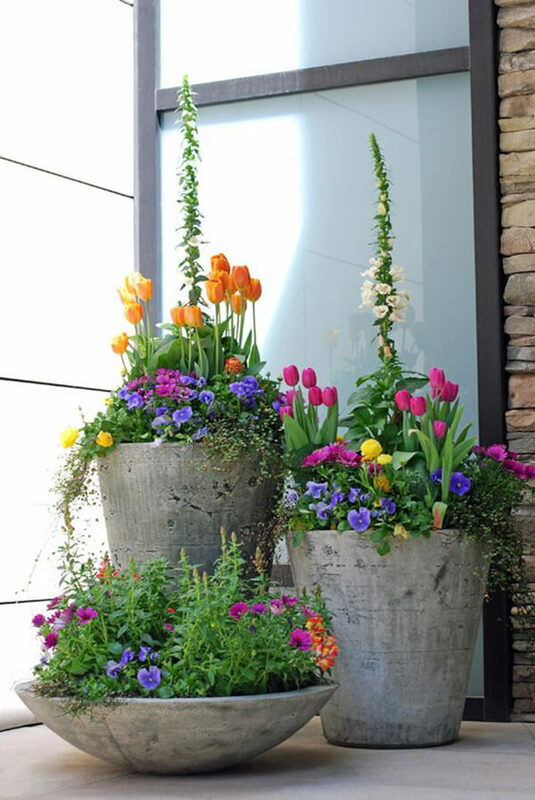 Fill these planters with a tall and dramatic arrangement of flowers. Snapdragons provide height and tulips provide a bright seasonal pop of color. Fill in the rest with annuals. 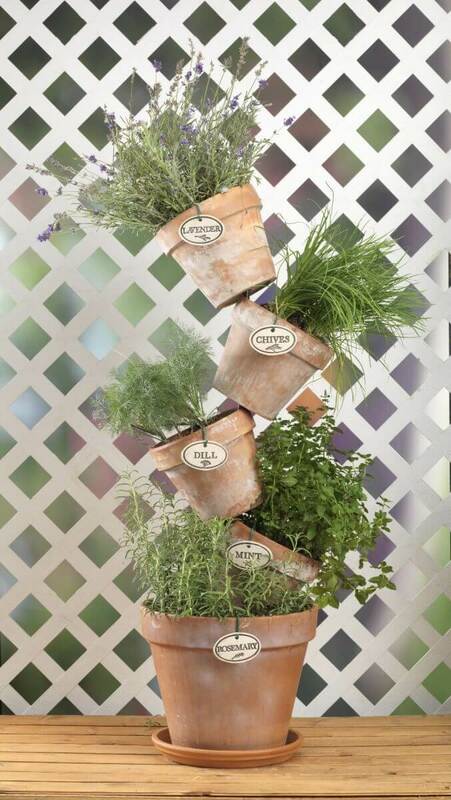 This is a cute way to display kitchen herbs. Thread a rod through the pots, setting them at an angle. Stack the pots on top of each other. Fill the pots with soil, but do not overfill them or the plants might fall. Add ceramic labels for each level. Use old tires for this charming display. First, paint three tires in bold, exciting colors. Then line the inside of the tire with a platform that fits. 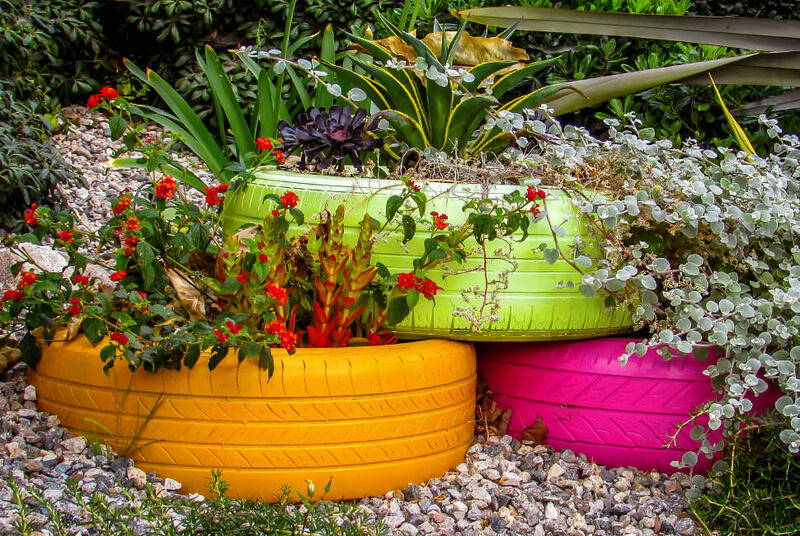 Stack the tires together in a pleasing arrangement and add soil. Use a variety of colors and heights to make a fun, creative arrangement. Use a round piece of plywood as a base for this planter. Remove the bark from an assortment of fireplace logs. Use logs with varying height and width. Arrange these in a ring around the edge of the plywood and screw them in place. Add a plant pot inside for a rustic look. This idea is as simple as finding old kids’ rain boots at the thrift store. Use a mixture of colors and sizes for variety. Drill drainage holes in the bottom of the boots and add potting soil. 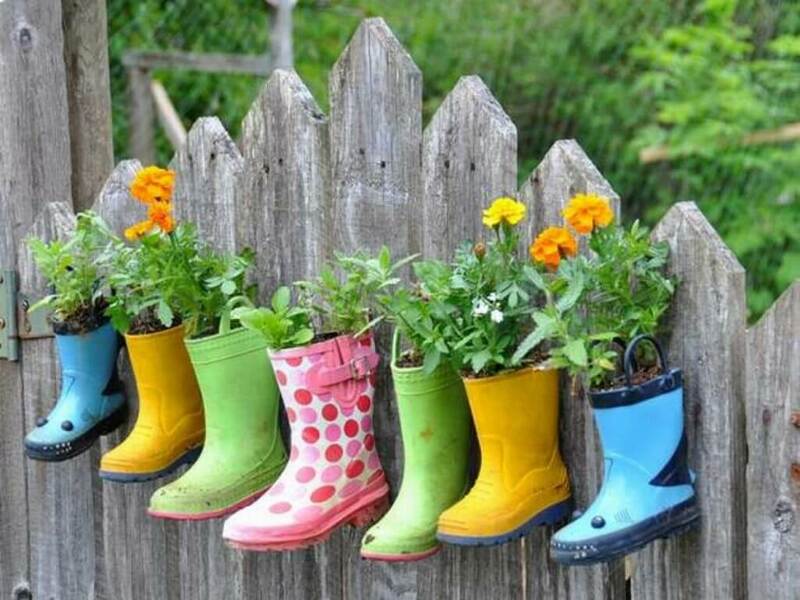 Hang the boots on a fence or wall and add flowers. 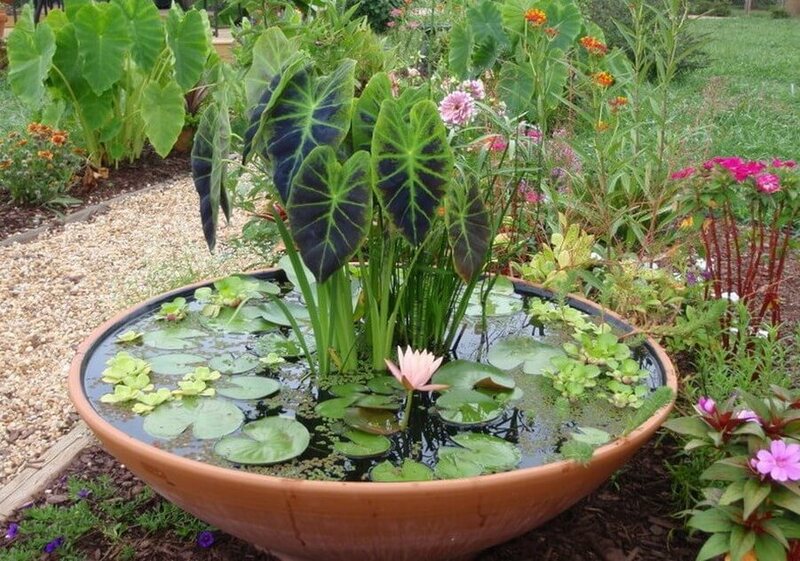 Make a container water garden with a large ceramic bowl. Add pebbles to the bottom of the bowl. Use a portable filtration system to keep your plants in ideal shape. Use a variety of water plants, from greens to water lilies. Be careful to keep your garden from growing stagnant, or the plants will die. 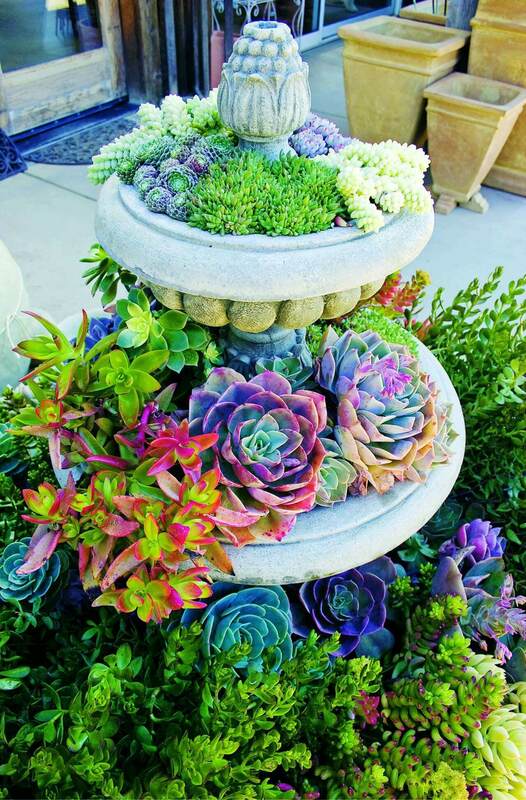 Use a large concrete fountain as a show stopping display for succulents. 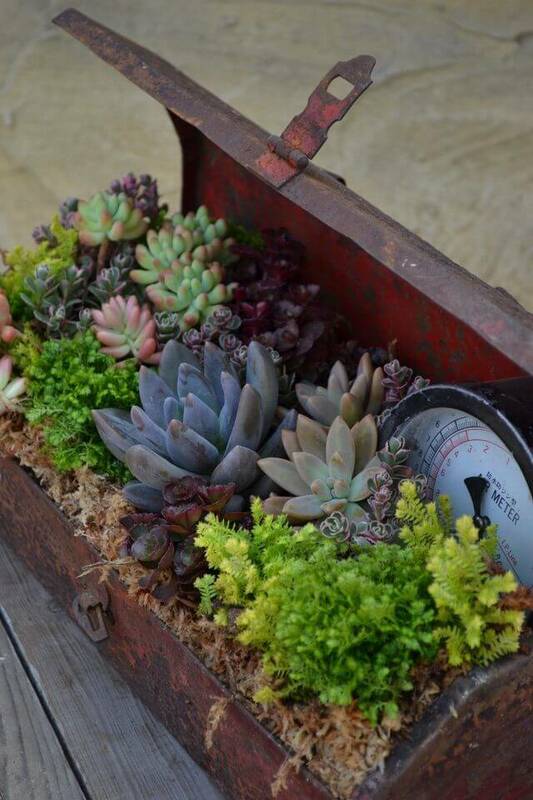 Start with small succulents in the top level and plant larger ones as you go down. Trendy multicolored succulents have a special place in this arrangement. Plant around your fountain with lush greens.